Want to write a blog post for #dctl? 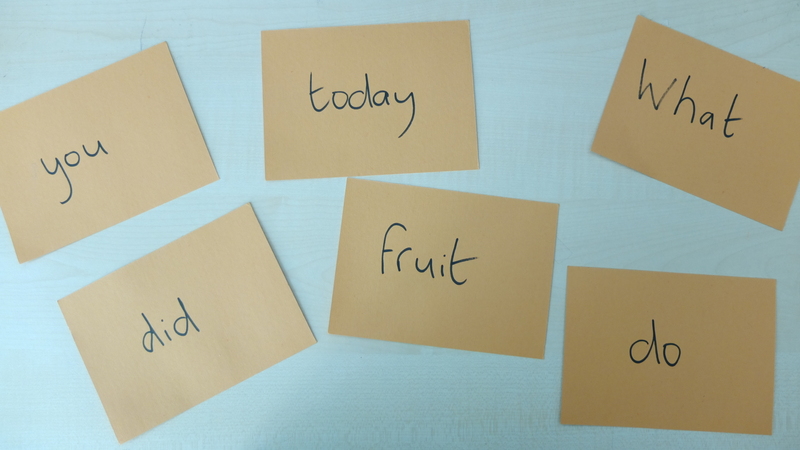 In this activity learners rearrange mixed up questions and ‘tinker’ with words. This raises their awareness of question forms in English and it’s fun! Uber-busy teachers can download the full lesson plan here. 2. Make three sets – one set for each question. You can also use different coloured card here so you can tell the different questions apart. Here is one of my questions below – what is the question here and what’s the ‘Red Herring’ word? That’s right. ‘What did you do today?’ is the question, ‘fruit’ is the Red Herring. *Note: to make it more difficult I omitted the question mark at the end of the question – students have to work this out themselves. However, I did capitalise the first word. 2. Explain that a ‘Red Herring’ is a piece of information which you think is correct, but which gives you the wrong answer. The correct answer is ‘Do you smoke?’ and the ‘Red Herring’ is the word ‘does’. 4. Give out the first question to your learners – one word per pair of students (or three). 6.Learners then have to identity the correct question form AND the ‘Red Herring’ word.They can do this my a) moving around the room to make the question correct or b) passing the cards around until the question is correct. 7. Repeat until you have gone through all three sets of questions. Elicit responses and write on WB. 9. Learners work in pairs asking and answering the questions. 10. (Optional) Teacher gives feedback on their question formation and goes over any problems e.g. word order in questions, auxiliaries, pronunciation (schwa). After you have finished with the three sets give out BLANK pieces of card to each pair (or three) and ask them to come up with their own ‘Red Herring Questions’. Tell them that they must be sure that the ‘Red Herring’ cannot be used in the question in any way. Here they are forced to concentrate on the task – forming questions! I hope you liked this post – tell me if you use it in class – particularly any interesting variations! Also, if you like the free lesson plans and warmers please take 1 minute to answer this very short user experience survey. To receive automatic updates please enter your email address in the box to follow the blog. Hello. (that was a red herring). Featured image: Red Herring. No Matter Project on flickr. CC license 2.0 Generic. Question. Paul Walsh. CC license 2.0. A wonderful activity to draw interest and recognition towards grammar in a lively and engaging way. I shall be trying this out with both my YL adolescent and adult learners. thanks for your kind comment Martin! The trick is to find a ‘Red Herring’ that distracts the learners long enough for them to play around with the language – good luck with trying this out with your learners! This entry was posted on September 16, 2014 by paulwalsh in DCT in action, For Teachers, Warmers and tagged activity, correct question, Decentralisation, Decentralised Learning, Decentralized Teaching, lesson plan, materials-free, pedagogy, question forms, question mark, questions, red herring, task, warmer. 10 Minute Warmers (2) What mood are you in today?